Delbert Whetter, who is a deaf father of two, helped test a new app called ChatterBaby, which alerts deaf parents when their baby is crying. For parents Delbert and Sanaz Whetter a crying baby is a particularly difficult challenge. The Whetters are deaf, so when they’re in another room they rely on cameras and remote noise-monitors to help keep an eye on their two children, one of whom is an infant. But those technologies, while helpful, have limitations. Sanaz and Delbert Whetter play with their young son. “We have a child who is talkative. The alerts go off, but there is no way to distinguish between loud talking noises and crying,” Delbert said. But now the Whetters have a new tool — an innovative app developed by UCLA researchers — that will help. Led by Ariana Anderson, assistant professor in residence of psychiatry and biobehavioral sciences in the David Geffen School of Medicine at UCLA, a team of scientists created Chatterbaby, which employs artificial intelligence to not only tell parents when their infant is crying, but also help determine why their baby is upset. 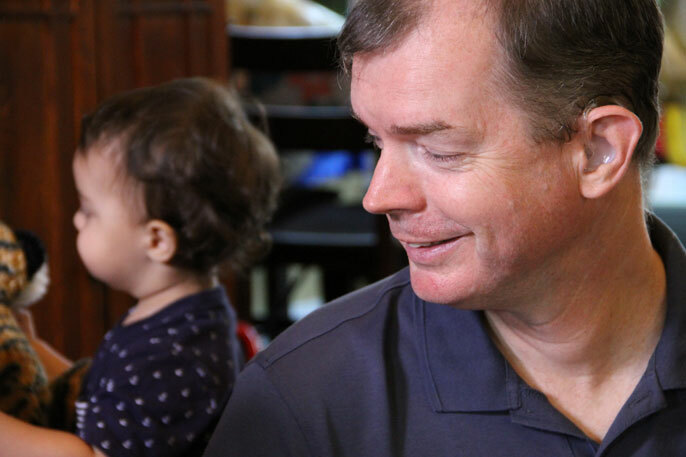 How the ChatterBaby app uses machine learning to analyze babies’ cries, and helps parents like Delbert and Sanaz Whetter. Arianna Anderson, assistant professor in residence of psychiatry and biobehavioral sciences in the David Geffen School of Medicine at UCLA. In creating the app, Anderson and a team of researchers uploaded audio samples of more than 2,000 infant cries. Next, they built and tested algorithms that translated cries into three categories: pain, hunger and fussiness. The algorithms correctly flagged the type of cry, such as pain cries from babies receiving vaccinations or ear-piercings, more than 90 percent of the time. The app, now available for free on iPhone and Android devices and at Chatterbaby.org, allows parents to record and upload their babies’ cries, which are then analyzed using artificial intelligence. Scientists hope that a new crying-pattern study launched through the app will provide insight into whether certain patterns can later be associated with specific infant development disorders, such as autism. In addition to helping parents who are hearing impaired or deaf, like the Whetters, the smartphone app is also designed to help new parents, who may not yet understand what their baby is trying to communicate. The app may also help some women with postpartum depression because research shows they may have more difficulty than women without depression discerning the meaning of their babies’ cries. But it’s the baby who may benefit the most from the technology. Studies show that faster rates of appropriate parental response to crying can facilitate language development in children. A device that helps deaf and hearing parents respond more quickly and accurately to vocal cues may boost language development. Anderson hopes information in the database will help identify other patterns or associations related to infant development, including autism spectrum disorder. Deaf children have over twice the rate of autism compared to hearing children. Research has shown that babies at risk for autism show abnormal cry patterns even before they are diagnosed. Anderson and her team will use Chatterbaby for a new study on the relationship between cry patterns and autism risk in both hearing and deaf children. A checklist of other risk factors for autism is also included in the app. This research was supported by NIH/National Center for Advancing Translational Science, the UCLA Clinical and Translational Science Institute, the Autism Center for Excellence, the Semel Institute at UCLA and the Burroughs Wellcome Fund.